Across the street from Google's New York headquarters on eighth avenue are a bunch of modern restaurants. One of them did not completely cover the sign of an old predecessor, a restaurant with an old 7-Up privilege sign. The picture aren't great but you can get a sense of it. Unfortunately the ideal place to take the photos would have been the middle of the street. Still a fun find. I have one card of Matt Brewer, from 1991 Classic Best. 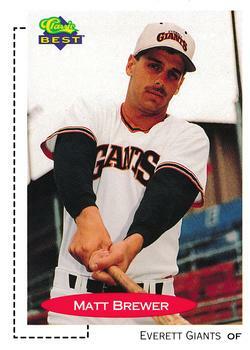 Playing career: Outfielder Matt Brewer played in the Giants organization in 1991 and 1992. In 133 games he hit .295 with 10 HR and 82 RBI. Where he is now: Anyone know where Matt Brewer is now? Google Autocomplete results: He is fourth when you type Matt Bre, between Matt Brezina, CEO of Sincerely, and Matt Brest, Partner at SeaStone Capital Management. There are no entries for the ballplayer on the first page of Google results; most are for a musician. Coming up next: The next profile will be Rod Brewer. I don't really have any cards that I've had and wish I had not gotten rid of. Collecting everything means I'm not really in a position like GCRL to sell a good card. I'm sure I've lost a few (in fact, I know I dropped a card on the train from one of my $3 boxes the other day but could not find it; I hadn't even had a chance to see what card it was). But, no real self-inflicted holes in my baseball card collection. However, when I first started collecting as a kid, it wasn't cards but stickers. The 1986 Topps sticker album was what got me into not just collecting but baseball itself. I didn't actually start collecting cards until the following year. 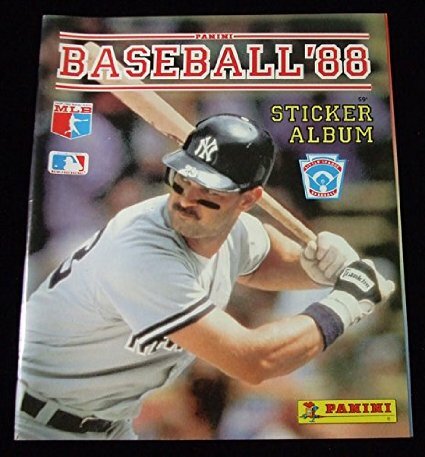 I had the Topps sticker albums for both baseball and football from 1986 to 1989, as well as a couple of Paninis, 1988 and 1989. However I did not keep these. Over the past few years I have ended up with some of the stickers for these albums and kind of wish I had held on to them. If anyone has albums that are either empty or mostly empty, I might consider trading cards for them. Remember my privilege sign obsession? 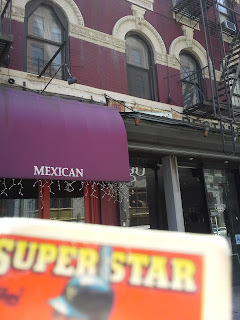 This is one of the more notable ones still left in Manhattan, La Bonbonniere, a Greenwich Village diner. The diner first opened in 1932 and the sign has to date back to at least the 1970s, probably earlier. I have two cards of Jace Brewer. This one is from 2000 Fleer Tradition Update. Playing career: Shortstop Jace Brewer played in the Devil Rays, Rangers and Royals organizations from 2000 to 2007. In 702 games he hit .251 with 30 HR and 246 RBI. Where he is now: A teacher and head softball coach at Washington High School in Oklahoma. Google Autocomplete results: He is third when you type Jace Br, between Jace Brown, who played baseball at Fresno State, and Jade Bryce, an MMA ring card girl. Another prominent Jace Brewer plays high school basketball in Tennessee. Coming up next: The next profile will be Matt Brewer. Always fun for a Yankee card I did not have to slip it's way in. Back in the '90s there were several card sets that regularly featured interesting photography. Pinnacle was just one of many (Upper Deck, Ultra, Stadium Club, etc). Now it's just very high-end Stadium Club. The 90's also saw a lot of pointless parallels, and the occasional awesome parallels, like Score Gold Rush. I read somewhere recently that SP stands for "Super Premium". Maybe that's common knowledge but I did not know that before. Another refractor finds its way in. Joe Nierko's son played 195 games in the major leagues. Pretty unusual to get a refractor in one of these boxes. I think he left it in because it was creased on the back, although somehow it didn't show up on the front. Lots more 2008 Bowman Prospects. No chrome this time but a lot of base and gold parallels. I'm really building up a few Bowman sets with these boxes. This box contained some 1995 Sportflix. Sportflics in the '80s were awesome cards that looked like you were holding a video in your hands. The 90's "flix" variation was a real disappointment, they seemed to go backwards in technology with just a slightly moving picture, sometimes with a fake background. Lots more '03 Fleer Tradition, too. I'm stocking up on some pretty random sets in these boxes, which is fine by me. Nice background on this Brian Tallet card. Got another $3 box today. Like usual there were about 1,500 or so cards in the box. About 40-50% was baseball, and of those there were probably 100-150 cards I needed. The cards are piling up but if you figure $.02 a card for ones I need, not even including cards I can use for trades, and they are still good deals. This box was a bit "meh" in terms of interesting cards, but here are a few highlights. There were a few cards that said "1st Bowman Chrome Card". It would be funny if it said "My 1st Bowman Chrome Card" - would sound like a toy for a small child. A nice shiny Walt Weiss from the 1995 Topps Embossed set. One interesting thing about these boxes is that I am getting cards from unusual sets like this that will make my trade piles more interesting (and break the monotony from all those 2007 Toppses). Cool to get a card numbered to /25 in one of these boxes. Chris Seddon won two games in the major leagues and now pitches in Taiwan. As usual, there was some oddball set I had never seen before. This UD Ionix has a great design - for a football card. This may be the coolest find yet for my wallet card. 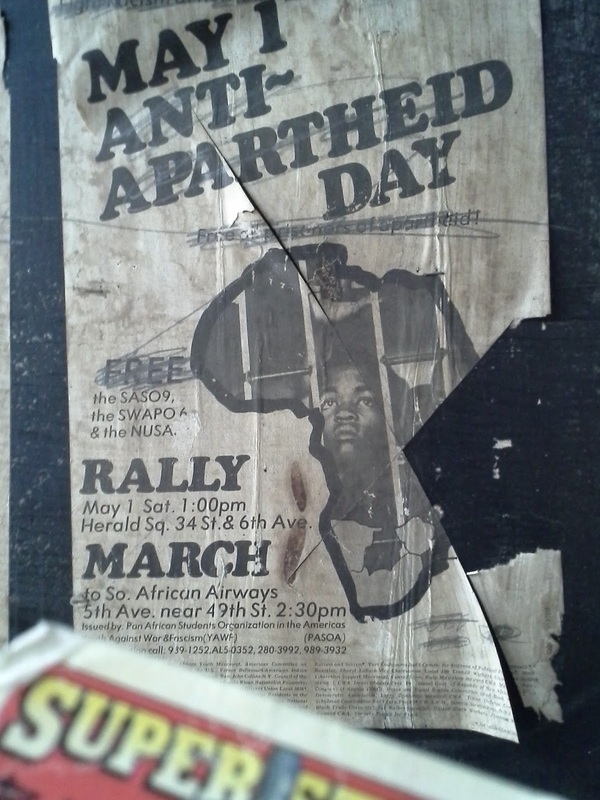 I had read about how an ad for a 1980 anti-nuclear concert was occasionally visible at the Herald Square subway station. I didn't find that but I found something even older, and at least as relevant - an ad for a 1976 anti-apartheid rally at Herald Square and subsequent march to South African Airlines headquarters. It would appear that at least at this subway station the MTA has not removed historically relevant flyers when switching out advertisements. Here's some highlights from another rockin' $3 box. Lots of Bowmans as usual. This time there was a large chunk of 2008 Bowman Chrome Prospects, as well as a few of the non-chrome variety. Dupes of many cards including Danny Duffy here are available for trade. These boxes always have a ton of cards from 2006, 2007 and 2008 Topps. I've already completed the latter two sets and just need Derek Jeter (#500) from 2006. Anyone have that card to trade? Here's a pretty awesome card to get from one of these boxes. Joc Pederson is the likely NL Rookie of the Year. This card is selling for $9 right now on eBay. (Autographed versions are in the $1,000s which seems absolutely crazy). There's always a new surprise variation in these boxes. How about a shiny foil version of the MLB showdown cards? I don't like Ron Darling but I love this shot of the A's in the Yankee Stadium dugout. They are "power metal" in the style of Iron Maiden and Dio. I'm actually a pretty big fan of that kind of music. I'm not a big music guy but when I do listen that is the sort of stuff I like. Their music is actually quite decent. See their website and youtube videos if you're curious. More of those weird Double-Header cards. This one of Eric Chavez with Miguel Tejada's legs didn't come out too well. Here's an insert I hadn't seen before. It's called "Invincible Sandlot Heroes". Somebody ought to make a baseball card insert set name generator. It would come up with better names than that. There were a lot of 1988 Topps league leader minis. This is one of the very few sets that I collected as a kid where I still need a lot of cards from. There was a ton of cards from the 2004 Upper Deck rookie update set. Lots of dupes to trade if anyone has needs; it's somewhat obscure. Boring, though. Believe it or not this is one of the more exciting photos in the set. A while back Prowling Cat posted some minor league cards he was looking to get rid of. I'm a sucker for minor league cards so I quickly claimed them. In exchange for a few cards and pocket schedules he sent me some really cool stuff. There was a nice stack of 1990 CMCs. I've finished off a few of the big minor league sets from this era but still need probably 3/4 of this set. Nice football card here. The rest of the trade package was three years of Salem-Keizer Volcanoes sets. The team is a Giants minor league affiliate. Hold that fake double play pose! This is from the 2001 set. What made this really cool was that about half of the cards in the 2002 and 2003 set were autographed. I remember Pat Misch from his time with the Mets. He's in the Marlins organization now. When I was a kid one of the oldest cards in my collection was Joe Strain's 1981 Topps card. It was the only one I had from the set for many years, and on the back noted that he was a substitute teacher in the off-season. Here is Joe's favorite player on the team, his son Ryan. He hit .302 so I'm sure no one complained about giving playing time to the manager's son. Terry Burrows pitched four seasons in the major leagues for the Rangers, Brewers and Padres. In 50 games he went 4-4 with one save and a 6.42 ERA. Now Business Development Manager at Polaris Construction in Sulphur, LA, he kindly answered my questions about baseball cards. 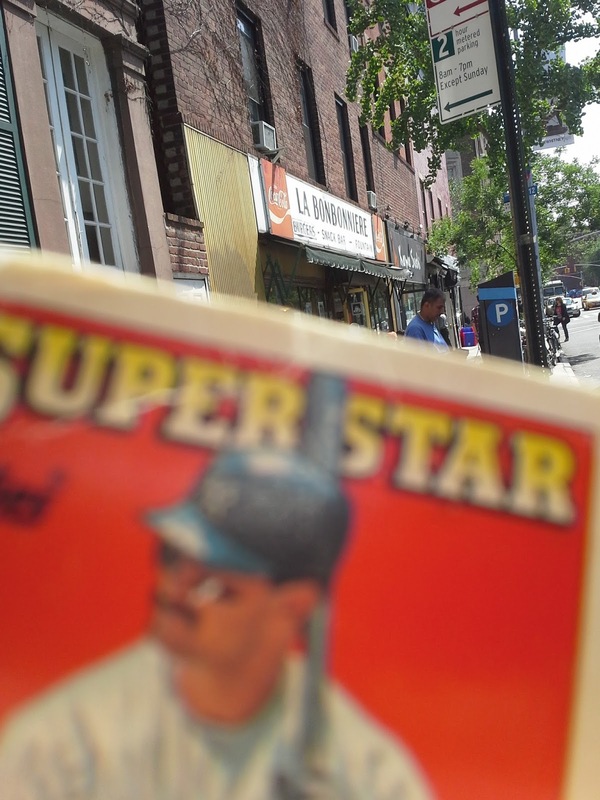 "For the most part I've never really collected baseball cards. 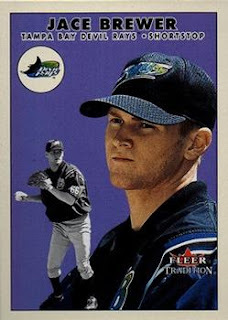 Some of the first minor league cards are pretty comical because they would have you pose for them and act like you just threw a pitch without a ball. 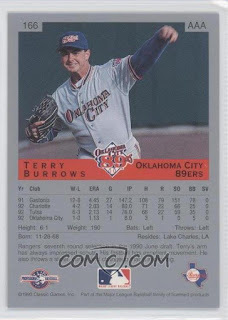 I guess my favorite card would be my first true big league card, one that was an action shot of my first year with the Rangers (a Fleer card)…Probably my favorite because I never had another big league card made from either of the other two teams (Brewers and Padres) I had a chance to play for!" The 1998 American League Rookie of the Year, outfielder Ben Grieve played nine seasons in the major leagues, mostly for Oakland and Tampa Bay. In 976 career games he hit .269 with 118 HR and 492 RBI. He kindly answered my questions about baseball cards. 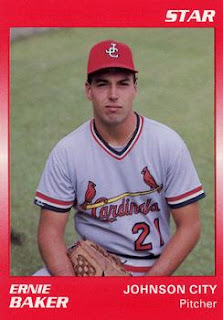 "My favorite cards are all the ones in my Minor League uniforms. They remind me that although I was a very high draft pick, I still had to prove myself to get the call to the Big Leagues. I did collect cards when I was young and still have them all. I have all the best guys from the 80's. It's a shame though that so many of them aren't worth what I thought they would be back then due to steroids. I have a ton of rookie cards from the likes of Roger Clemens, Barry Bonds, Mark McGwire, Sammy Sosa, Juan Gonzalez, etc. Too bad things played out the way they did. However, I do also have many Tony Gwynn, Wade Boggs, Rickey Henderson, Ken Griffey Jr. Rookies as well. My favorite memory of card collecting was going to a card convention in Arlington and spending my allowance on a Tony Gwynn Topps Rookie card ($5 at the time). I got home and there were 2 extra of the same card hidden behind it. I felt a little guilty but was so excited to have 3 for the price of one. 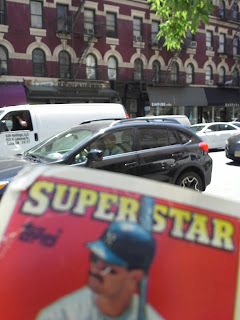 Maybe responding to your blog offsets my bad baseball card Karma!" 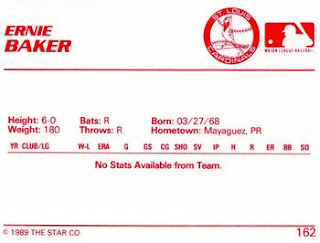 Ernie Baker pitched in the Cardinals organization from 1989 to 1992. In 137 games he went 10-8 with a 2.85 ERA. Now the owner of Baker's Baseball in Fredericksburg, VA, he kindly answered my questions about baseball cards. My first professional baseball card was an error card! They got my name right, but height and weight were way off. Also I wasn't born in Puerto Rico. George Brett!! Have every card from every year he played!!! I collected a whole decade of baseball cards in complete sets. My favorite set was the 84 Donruss set that I traded for Willie Mays catch, Ernie Banks All-star card and something else I can't remember. I have two cards of Daniel Brewer. This one is from 2009 TriStar. Playing career: Outfielder Daniel Brewer played in the Yankees and Braves organizations from 2008 to 2013. In 570 games he hit .276 with 25 HR, 244 RBI and 109 SB. Where he is now: A coach at DeMarini Baseball in Illinois. Google Autocomplete results: He is third when you type Daniel Brew, between Daniel Brewster, Democratic senator from Maryland in the 1960s, and Daniel Brewster WVU, a sociology professor. Another prominent Daniel Brewer is a litigation associate at Drinker Biddle in Philadelphia. Coming up next: The next profile will be Jace Brewer. Infielder Keith Miller played for the Mets and Royals from 1987 to 1995. In 465 games he hit .262 with 12 HR and 92 RBI. Now an agent at ACES Baseball Agency (clients include Dustin Pedroia and David Wright), he kindly answered my questions about baseball cards. "I don't collect cards and never did. I always said and believe today it is a huge honor for any player to be put on a baseball card‎ so I guess all my cards are my favorite." Jeff Grotewold played ten seasons of professional baseball, reaching the major leagues with the Phillies in 1992 and the Royals in 1995. In 87 big league games he hit .228 with 4 HR and 11 RBI. Now the owner of Carpet Station in Crestline, CA, he kindly answered my questions about baseball cards. "My favorite card was my first one. First time you see yourself on a big league card is great." Lots of Bowman as usual. I really like the Bowman International cards. This one of Austin Kearns down on the farm is really cool. I wonder if Max Sapp hates his first name? I don't think I've seen a last-name-only autograph before. Actually, looking online it looks like his autographs always include his first name, so this might be just an error on Bowman's part. Sapp played three years in the minors before his career was ended by a life-threatening bout with meningitis. Most of the non-Bowman stuff was pretty standard, but as always there was a set or two that came out of left field, in this case a couple of Ultimate Victory cards, which were a shiny, blue-bordered parallel set to Upper Deck's Victory line. But flip it open, and it turns out those aren't Asencio's legs, they belong to Runelvys Hernandez! Actually got two of this particular card so one is up for trade, as well as several of the non-flip variety. This Tino card was stuck behind a Phil Nevin card, which is pretty much the only way to get a star Yankee out of one of these boxes. 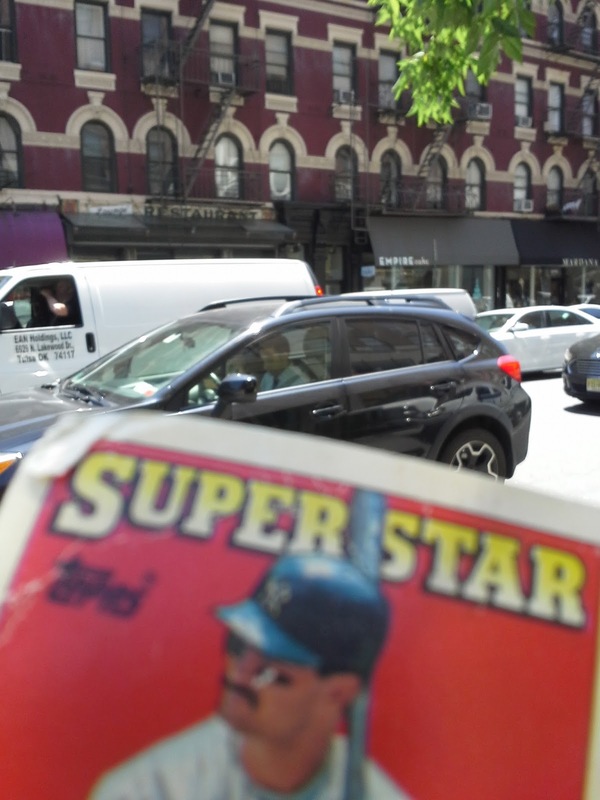 But I was glad to see a card of unsung Yankee hero Ramiro Mendoza, and on a fairly unusual set (at least here on the East Coast). I had never seen this particular set before, an insert from 1994 Score. There was a little junk wax, so I used them for #RandomActsOfCardness. Last week a lady posted a 1990 Fleer Jeff Musselman card she found on Seventh Avenue, maybe someone will post one of these?